The Orbicular granite deposit is located 35 km west of Mount Magnet in Western Australia. This unusual granitic rock, located on Boogardie Station, is one of a few orbicular granite localities known worldwide. The orbicular granite is hosted by a pink, medium-grained, late Archean granitic rock, comprising myrmekitic biotite granodiorite that becomes tonalitic in places. Information from diamond drillholes indicates that orbicular granite bodies may have formed as saucer-shaped, sill-like structures within the host granodiorite–tonalite. Over the area of the Boogardie quarry, the orbicular granite appears as an oval-shaped body, about 40 m wide and at least 55 m long. Maximum thickness at the centre is 11.4 m, tapering off in all directions to relatively small thicknesses at the outer rims. Within the sill-like structures, abundant granitic orbicules are contained in a leucogranitic body of variable tonalitic composition. The black and white, concentrically banded orbicules are of spectacular appearance. Orbicules are mostly ellipsoidal but also include lesser numbers of near-spherical, irregular and broken shapes. Orbicules have an average length of about 140 mm along their longest axis by 75 mm in width. Orbicule spacing varies from orbicular masses in tangential contact with one another to a maximum separation of about 100 mm, although overall orbicule distribution appears roughly uniform throughout the rock, as shown in the photograph of the matrix cut by a pegmatite vein accompanying this article. 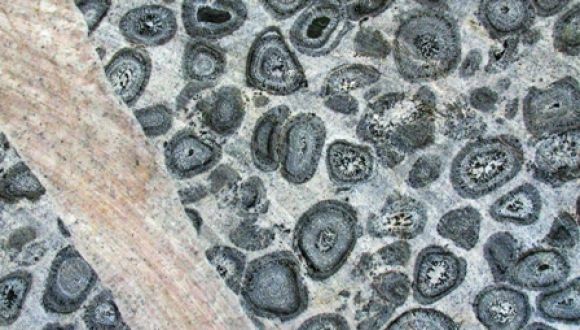 Individual orbicules are generally separated from the enclosing granitic matrix by a mid- to dark grey outer shell up to 10 mm thick, which is made of mainly fine- to medium-grained hornblende, biotite and plagioclase feldspar, with minor opaque oxide and titanite. Inside this protective shell, orbicules have a hornblende diorite composition, largely composed of plagioclase feldspar and hornblende with lesser amounts of biotite, opaque oxide and titanite. Orbicules usually contain five to seven (or even more) major, well-defined concentric zones of variable width, structural complexity and mineralogy. Some major zones may be up to 15 mm wide and commonly contain large, irregular, elongate, radially aligned hornblende grains interspersed with white plagioclase. These hornblende grains may extend across the entire width of the zone and are commonly tapered internally to a point, as shown by the spectacular image of the individual orbicule accompanying this article (Fetherston, 2010). Bevan (2004) proposed that the orbicules were formed by crystallisation from a fluid-rich, supercooled dioritic magma. Variations in orbicule type and layer structure reflect a very dynamic history of crystallisation influenced by changes in magma composition and degree of cooling. The presence of broken fragments and variations in zone mineralogy indicate that proto-orbicules were very mobile in the magma chamber, probably propelled by convection currents within fluid-rich margins. Orbicules were eventually subject to gravity settling to form the deposit visible today. It is evident that, at the time of settling, orbicules were still in a plastic state as they are often deformed or moulded together. Some orbicules appear to have been dragged along by the current while others show evidence of mass movement after settling. Further recent information on the nature and origin of the orbicular granite is given in Bevan and Bevan (2009). Because of its visually spectacular orbicular structure, relative rarity and ability to take a high polish, the orbicular granite has been quarried at different times, supplying blocks and slabs mainly to artisans and monumental masons. Prime examples of completed works include high-quality ornamental works such as contemporary sculptures, interior decorative panels and tables. Floating orbicular granite spheres measuring up to one metre in diameter are also popular. Bevan, J, 2004, Archaean orbicular granitoids from Boogardie, near Mt Magnet, in Western Australia: Dynamic Earth: Past, Present and Future: Geological Society of Australia, Abstracts 73, 17th Australian Geological Convention, Hobart, p. 252. Bevan, JC, and Bevan AWR, 2009, Nature and origin of the orbicular granodiorite from Boogardie Station, Western Australia: an ornamental stone of monumental proportions: The Australian Gemmologist (2009), v. 23, p. 373–432. Fetherston, JM, 2010, Dimension stone in Western Australia, Volume 2, Dimension stones of the southern, central western, and northern regions: Geological Survey of Western Australia, Mineral Resources Bulletin 24, p. 35–43.